Two weeks ago today, we welcomed into the world Amelie Mae Jackson Rolt and our family was complete. Whilst she wasn’t quite as speedy as her older brother (50 minutes!! ), there was a moment of panic that she might make her arrival on Barnes High Street. Luckily though, we made it to Chelsea and Westminster Hospital and the safety of the birthing suite and she arrived not long after with a mop of dark hair much to our surprise with Seb being such a blondie. Seb has been totally smitten with his little sister, endlessly trying to give her cuddles and kisses, although I’m waiting for the novelty to wear off! That will probably happen just as Will’s paternity leave ends and it’s just the three of us at home. We’ll muddle through though and find a new routine to make our days work. It’s funny heading back into newborn territory and trying to remember what you did the first time round. You soon realise just how much time you must have had because with an energetic toddler in the house, there is no time for resting and watching endless hours of Grey’s Anatomy! Amelie’s sleep time is spent making puzzles, playing football in the garden and generally showering Seb with as much attention as possible. But every so often I manage to time it right with both babies asleep and get to spend a little time back in the kitchen making something to celebrate our latest arrival. I’ve been making a few different ice creams recently but it’s hard not to go back to making one of my favourite ice cream flavours, mint choc chip. 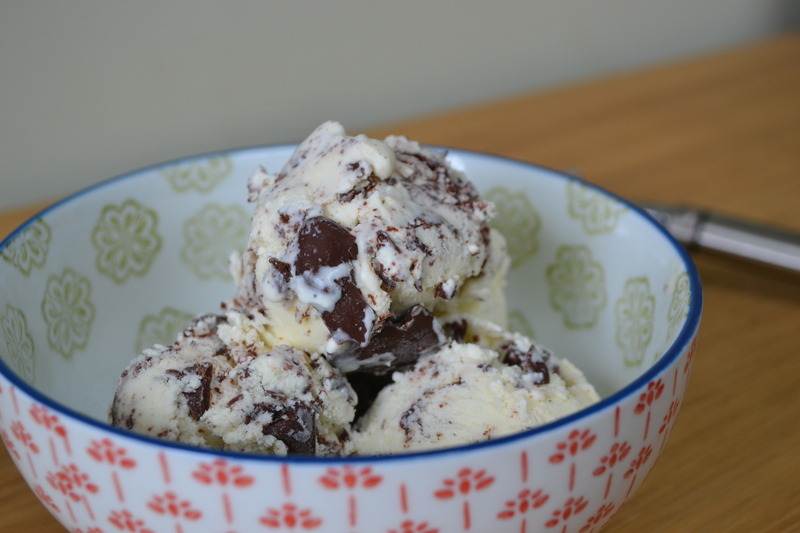 It’s a simple ice cream flavor to make and the only adaption I made to this winning combination was to use sea salt flavoured dark chocolate to provide the crunchy choc chips. 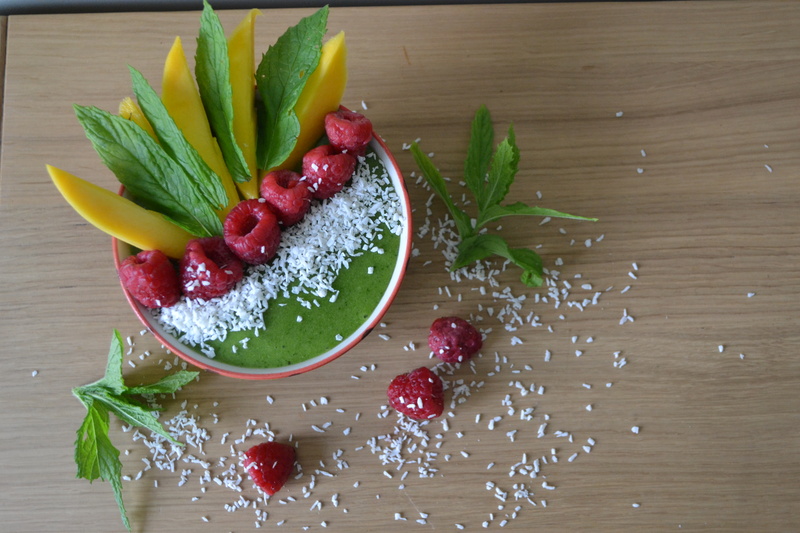 Fresh mint was picked from the garden which gives a clean-cut freshness that you’ll not find using extracts. It is a slightly more subtle mint flavor but I think this pairs beautifully against the creamy vanilla tones originating from the vanilla pod. 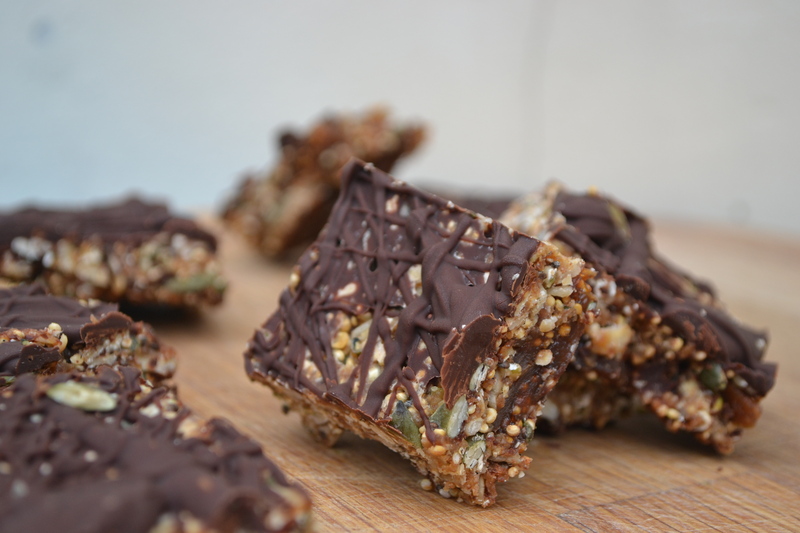 The dark bitter chocolate provides some crunchy texture and the saltiness cuts through the rich cream making it an addictive flavor combination. It’s hard not to sit with the tub in hand out in the garden, the sun shining and Amelie having a snooze whilst I devour mouthfuls of moreish ice cream. 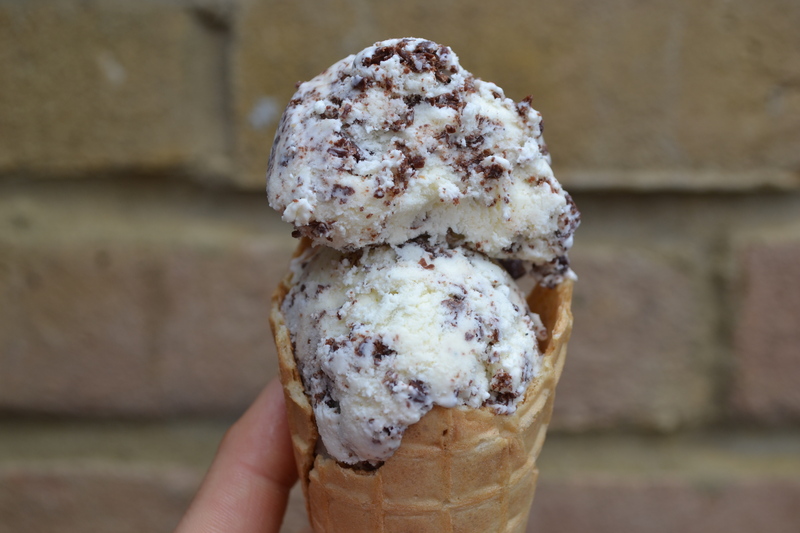 Mint choc ‘sea salt’ chip ice cream. Pour 250ml of the double cream into a saucepan and add your sugar and salt followed by the seeds from the vanilla pod and the pod itself. Warm the mixture over a medium heat and continue to sit until all your sugar has dissolved. Once your sugar has dissolved remove the saucepan from the heat and add the remaining 250ml double cream and the whole milk and stir. Add the vanilla extract, mint and stir again. 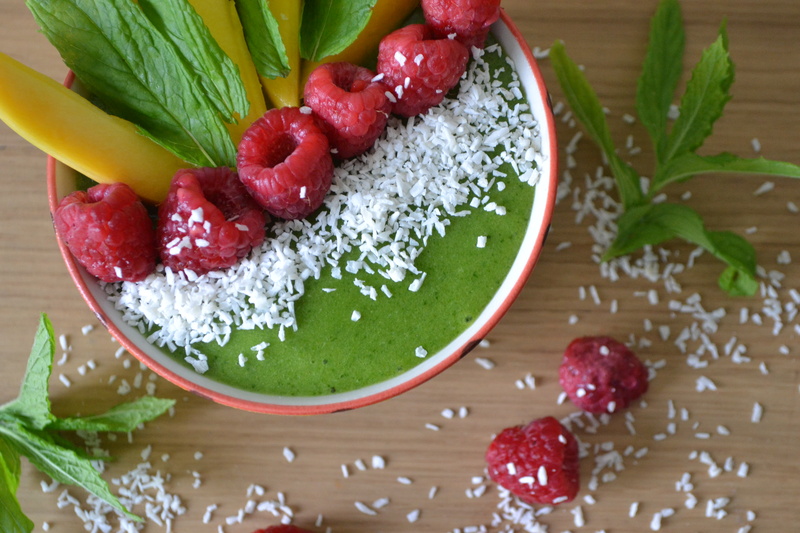 Pour into a bowl and chill in the fridge for a few hours or overnight. Before churning, pour the mixture through a sieve into a jug to remove the mint and vanilla pod. Churn the mixture in your ice cream machine according to manufacturer’s instructions. Whilst your ice cream is churning you can get on with melting your chocolate. Break your chocolate up into chunks and put in a bowl over a saucepan of simmering water. Make sure the water isn’t touching the bottom of the bowl or the chocolate will burn. Add your coconut oil to the chocolate and gently stir every few minutes until the chocolate has melted. Take off the heat. 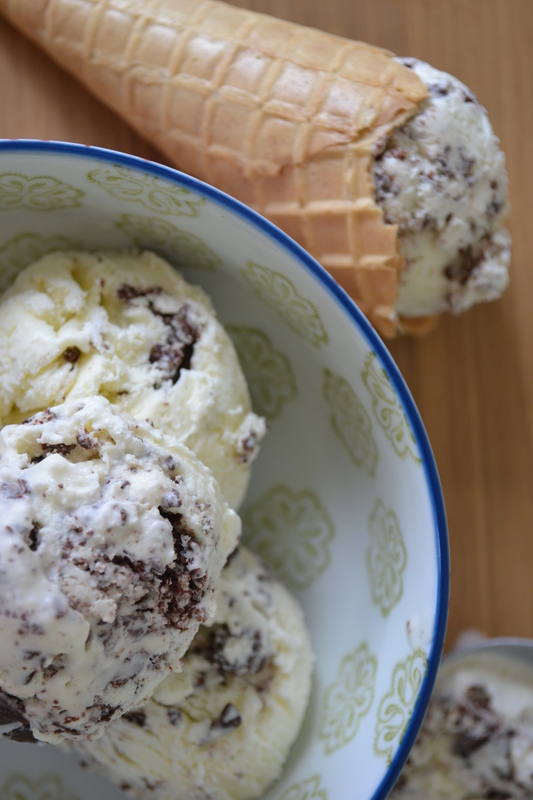 Once your ice cream has churned add a third to your tub an pour in some of the chocolate and stir through into swirls. The chocolate will harden very quickly so work fast. Then add another third of ice cream on top and some of chocolate and swirl through again. 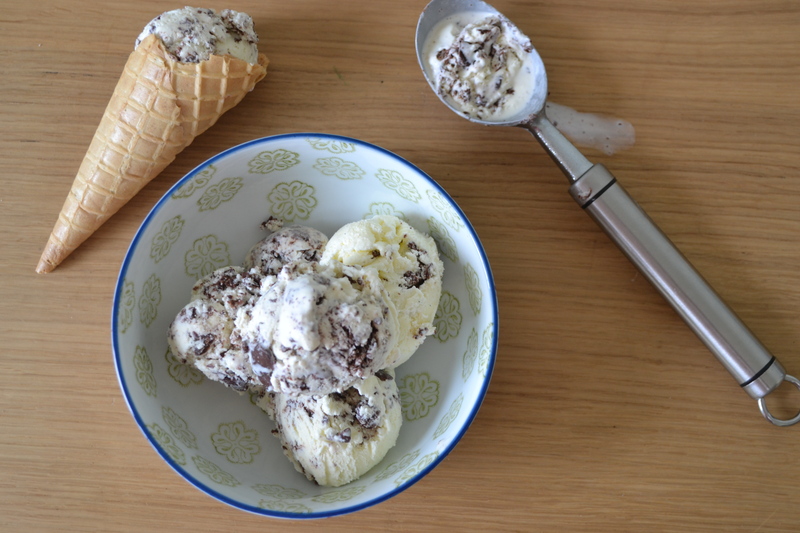 Repeat with the remaining ice cream and chocolate and you should get a good distribution of chocolate chips through your ice cream. Place your tub of ice cream in the freezer to firm up properly. I started writing this blog last Sunday morning and then a little person by the name of Amelie Mae Jackson Rolt decided to show up! So I’m rather late posting it and obviously I wrote it a week ago, so you’ll have to forgive my tardiness but I’ve been rather distracted with cuddles and snuggles this past week. Monday saw the start of Wimbledon which is two weeks of the year I love. I love everything about it; from the total ‘British-ness’ of the event, the vibe in Wimbledon village and the fact that it’s stuck to its guns and kept that all white dress code. I love the interviews with people queuing each morning and seeing what the new towel design is each year (! ), and seeing how quick the ball boys and girls can get the cover over the courts when it rains! Maybe it’s because I was born on Women’s Finals Day that it’s just in my blood. I’ve been lucky enough to go a number of times over the years, once being with my Dad a long time ago to see Courier take on Sampras in the 1993 final. I was a massive Courier fan rather than Sampras as I loved his ridiculous ‘western grip’ forehand and how he just seemed to work so hard out there on every point, but much to my dismay, Sampras came out victorious. Will and I have been a couple of times and the last time we went we really ‘got it right’. I’m all about having a picnic on Henman Hill / Murray Mound (depending on which generation you grew up in) and soaking up the atmosphere. We packed our cool bag with everything M&S could offer and of course a couple of bottles of Prosecco and some cans of Pimm’s to keep us going through the day. We had great seats on Number One Court and were lucky enough to get some decent matches whilst nipping out to ‘the hill’ to catch some of Murray. The sun shone on us and the day lived up to all expectations. Of course when you think of Wimbledon you think of strawberries and cream, Pimm’s and maybe the odd game of tennis goes on in the background. 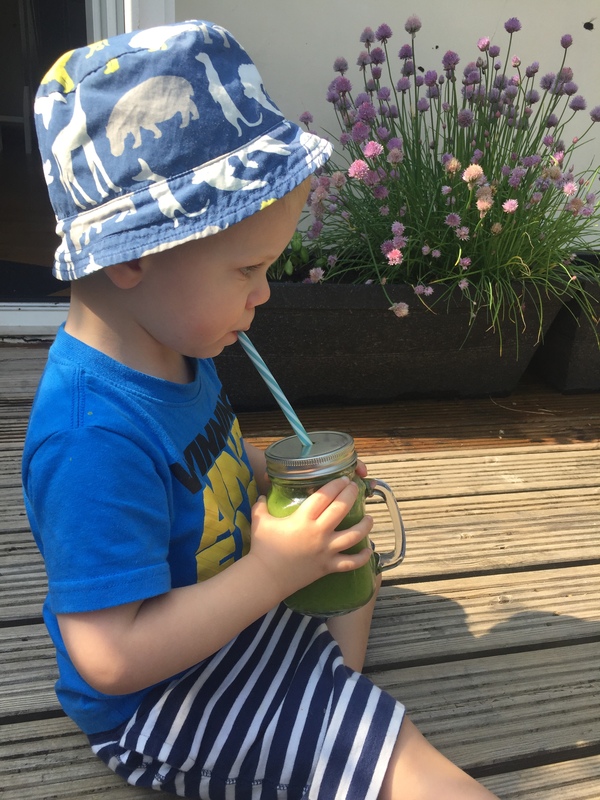 Strawberries can’t get much better than they are right now in the UK and we’re going through packets and packets of them on a weekly basis – mainly consumed by just me and Seb. We’ve made strawberry overnight oats for breakfast, strawberry and banana smoothies for the afternoon and best of course just served as they come straight out the packet watching the boats go past on the River Thames. 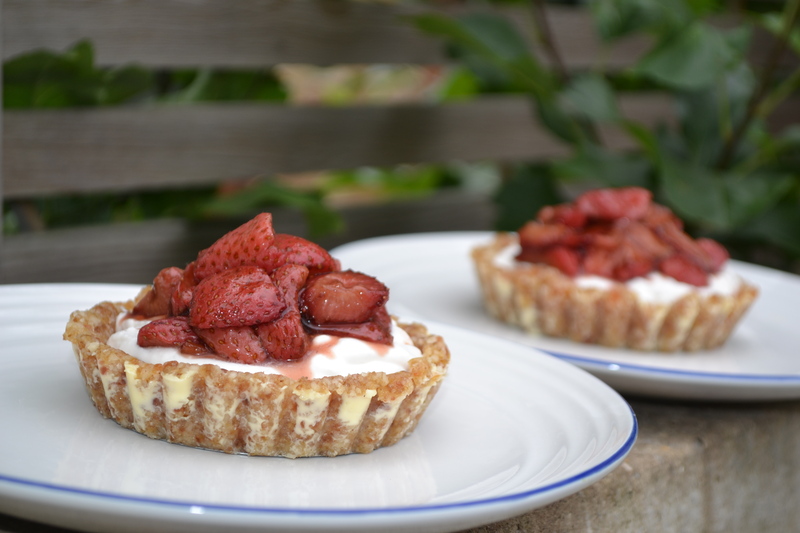 It’s hard to mess around with a fruit when it’s so good just served fresh as it comes, but I think these little roasted balsamic strawberry and coconut tarts work beautifully as a summer dessert for a picnic or to finish off a BBQ in the sunshine whilst watching the tennis. 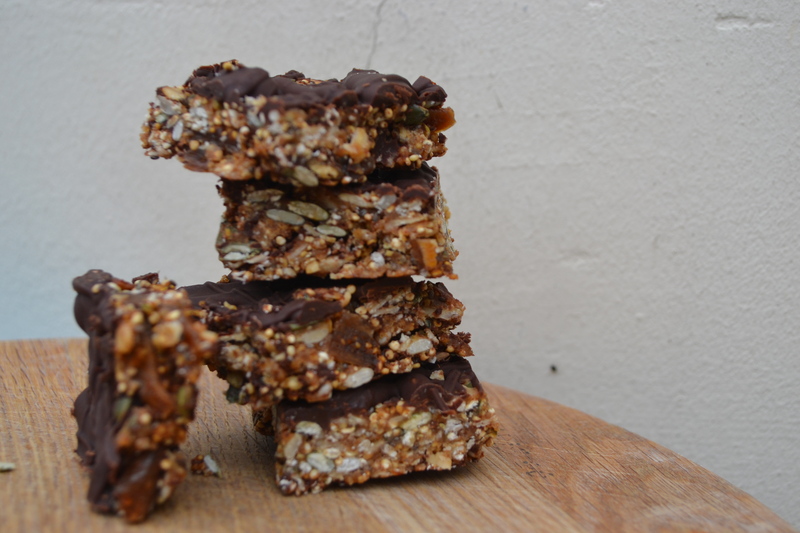 The base is a lovely raw combination of medjool dates, macadamia nuts and almonds. 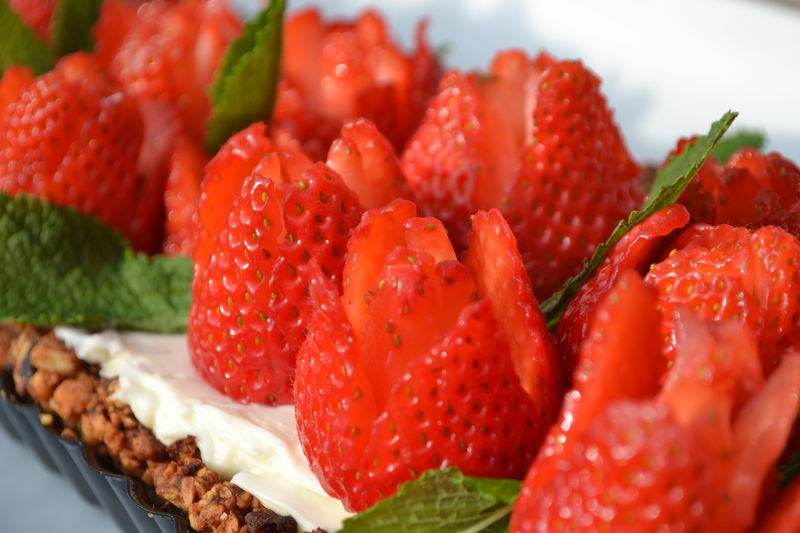 The whipped coconut cream is sweet and light and provides a gorgeous pillow for the roasted balsamic strawberries to sit up proud on. 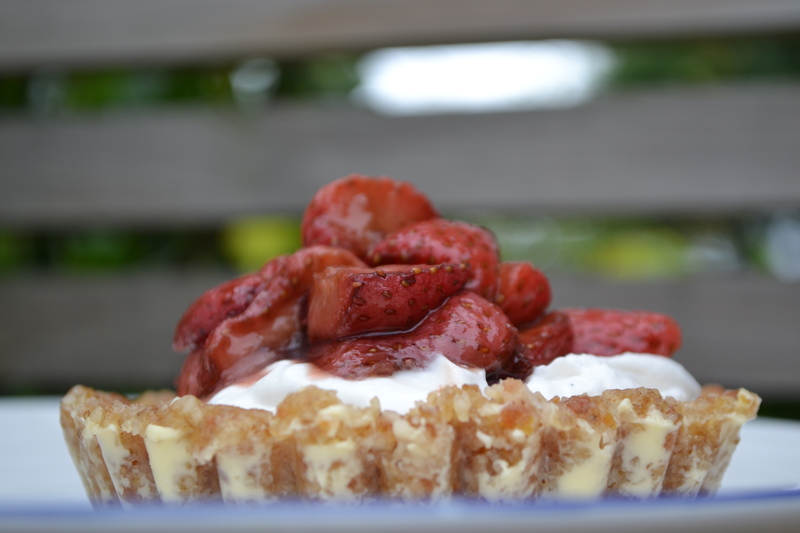 It’s really pretty simple but the combination of flavours provides the strawberries with their shining moment in an alternative way to being served up fresh from the packet. Butter your tart tins really well. 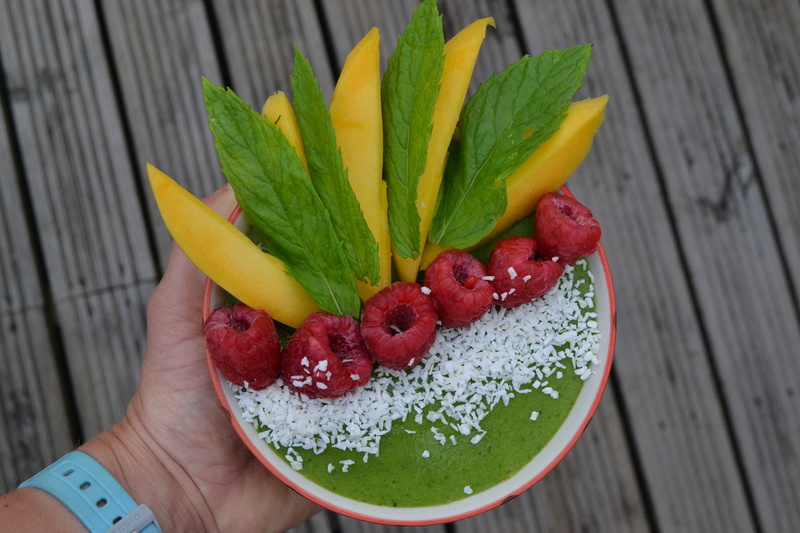 Begin with your base by placing all your ingredients in a food processor and blend to your ingredients come together a little. Spoon your ingredients into your tin and using the back of a spoon press into your tin to make an even layer all the way round. Place your tarts in the fridge to harden. Whip your coconut cream, honey and vanilla bean for a few minutes into you have soft light peaks, as you would with double cream. 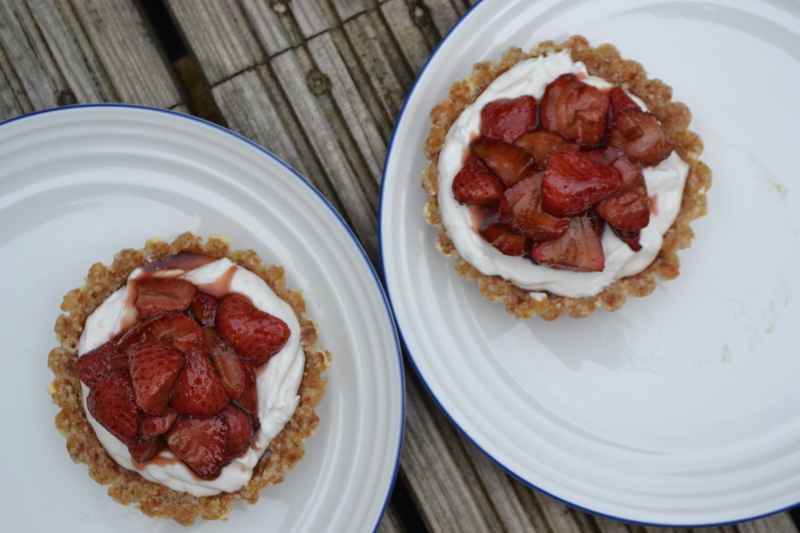 This will be more than enough cream for the two tarts but you can use the rest with fresh fruit or in your porridge, or with some granola. Delicious! Turn your oven to 180 degrees. 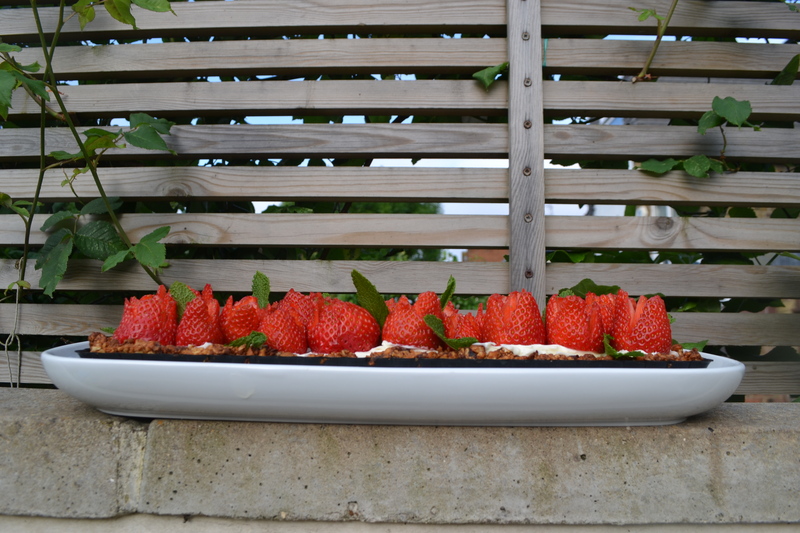 Mix your strawberries with the balsamic vinegar and coconut sugar and leave to marinate whilst your oven heats up. Pour the strawberries along with the liquid into an oven proof dish and bake for about 10 minutes. 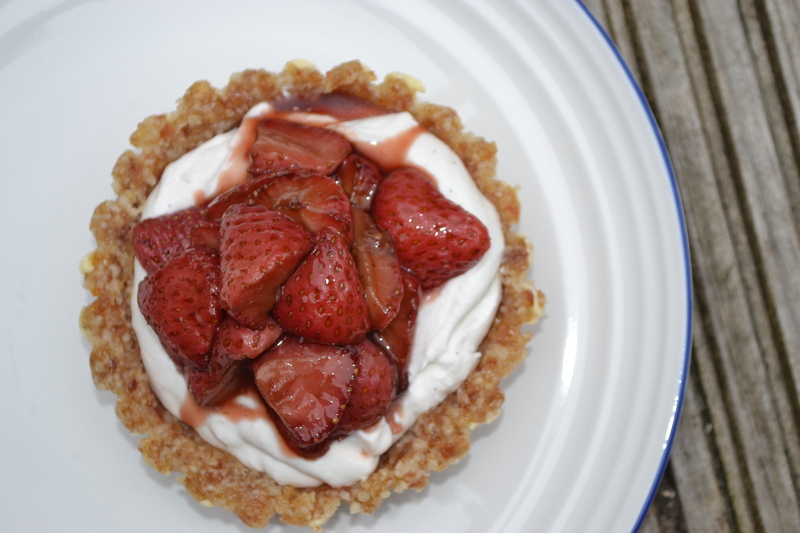 You don’t want the strawberries to turn to mush and to keep some texture. Once roasted, remove from the oven and place in a bowl to cool. Remove your tarts from their tins. I think the easiest way to do this is to place the tin on top of a small glass and gently maneuver the outer tin downwards. If it’s sticking leave for a few minutes and the buttered tin should loosen. You can always serve them in the tin if you think your base might break! 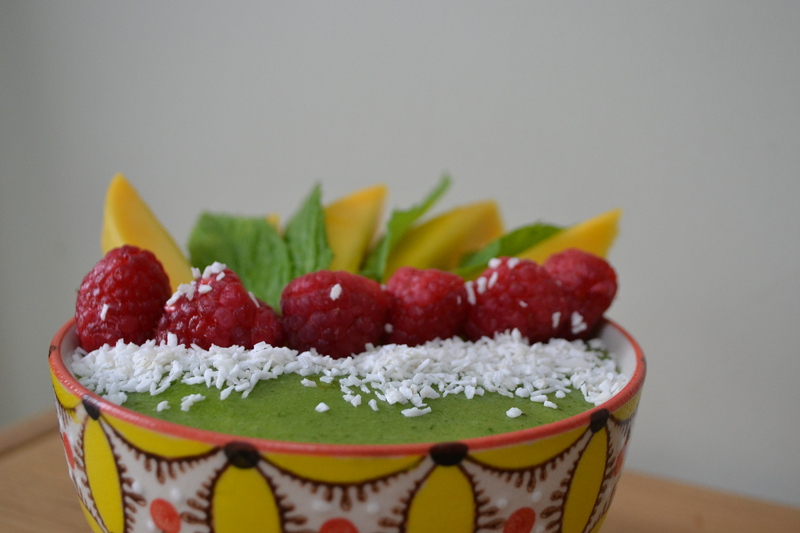 Spoon in your coconut cream to form an even layer. Top with your strawberries and some of the balsamic glaze. You can keep these in the fridge to serve when you’re ready. Today is Father’s Day and it’s easy to get swept up in making sure your kids have come up with something creative for their Dad and forget to be thankful for your own Dad and remember how lucky you are to have them in your lives. I’m especially lucky I think to have a Dad that has always been there to support me in whatever decisions I made, can direct me in the car no matter where in the country I am (in the days before Sat Nav and Google maps! ), doesn’t mind reading every blog I write to check for grammar and spelling mistakes, uses emojis almost as much as I do on WhatsApp and most importantly loves me for exactly who I am. And I have to say it’s the sweetest thing in the world to see how much Seb adores him and watching them walk off hand-in-hand every week when Dad helps to look after Seb. A lot of my childhood was dominated by going round the country playing tennis tournaments and whilst Mum took on the majority of the driving, I do remember a number of trips in the car, particularly before the bigger matches where Dad came along too and would often put on Rocky ‘Eye of the Tiger’ in the car in an effort to get me geared up for the big match. Makes me chuckle to think back about that now. He even flew with me to Florida when I was 13 years old and dropped me off at a tennis academy to then get the next flight home so that I didn’t have to travel by myself. He was more than happy to stick me on the plane by myself the next time, although he might have regretted it when I got a little lost in Miami airport and called home probably causing a very large phone bill! Whilst I won’t be seeing Dad on Father’s Day, I did sneakily send Mum home with a card and present earlier in the week. I wasn’t sure he would appreciate the present Seb made Will which was his footprints on a card saying, ‘I love you Dad from the top of my head to the tips of my toes’ and actually a decent bottle of red was rather more up his street. 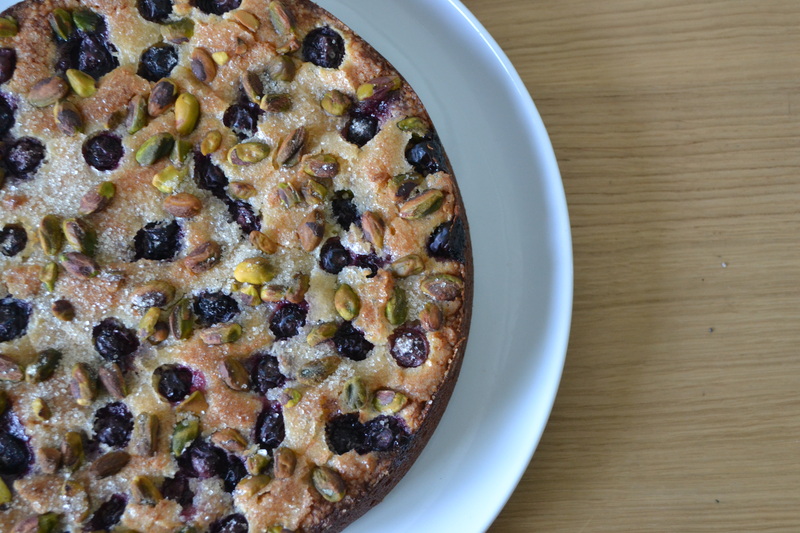 We had friends round for a BBQ on Father’s Day and we finished off the meal with this delicious blueberry and pistachio ricotta cheesecake. I had a tub of ricotta in the fridge and that’s really where the inspiration came from. I came across a recipe by Honey & Co. (a lovely restaurant in town) and just played around with the ingredients a little to work with what we had in the cupboards. The ricotta keeps the cheesecake beautifully light and moist, which is why I’m calling it a cheesecake rather than a cake. 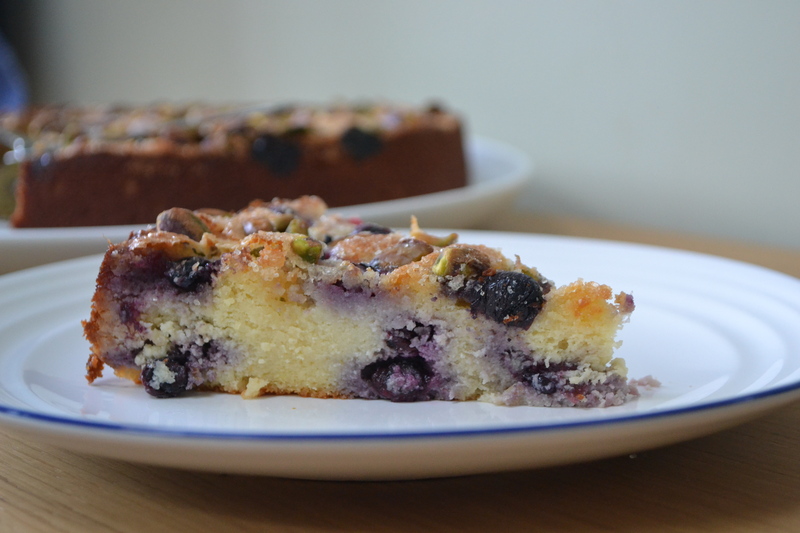 The blueberries bursting with tartness and the use of ground nuts providing texture within the sponge and the green jewel pistachios on top delivering that much needed crunch. You could definitely sub in different fruits or nuts, I’m sure raspberries and hazelnuts would be a delicious combination. Happy Father’s Day to all those Dad’s out there. No idea what we’d do without you. 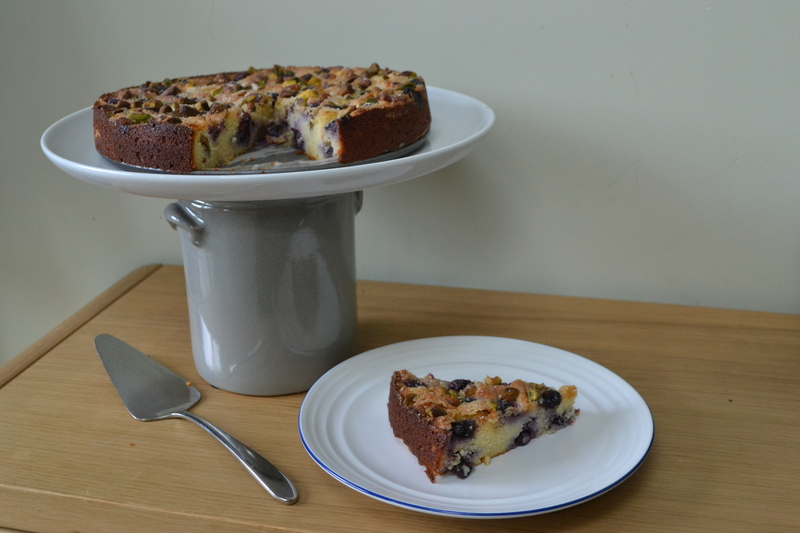 A take on recipe by Honey & Co.
Line and butter a 23cm loose bottom cake tin. Begin by creaming together your butter and caster sugar in a mixer until it is light and creamy. Add one egg at a time, making sure each egg is well incorporated before adding the next. Add the flour, salt, lemon zest, ground ginger and ground almonds and mix well until the mixture is properly combined. Add your ricotta and gently fold through until it is incorporated in the batter. Add half your blueberries being careful not to burst them. Spoon the mixture into your tin and smooth out to form an even layer. 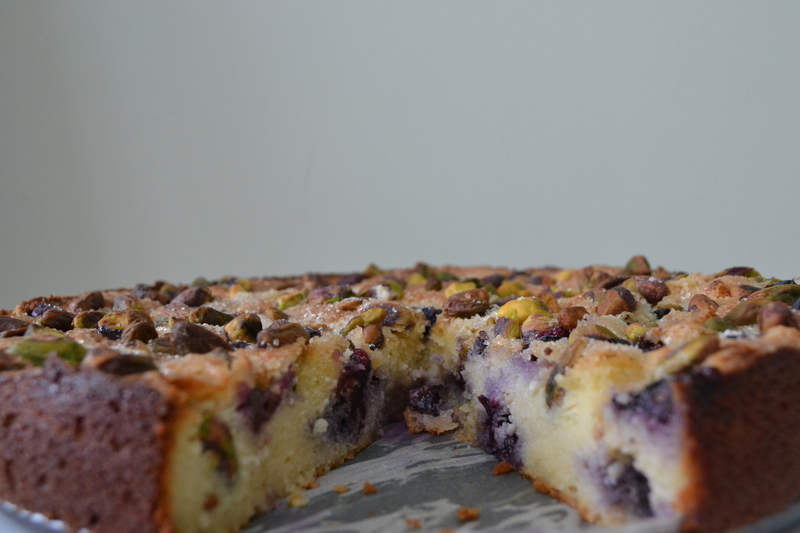 Sprinkle on your remaining blueberries, pistachios and top with the granulated sugar. Bake in the oven for 55-65 minutes until the cheesecake has set. The blueberries will have exploded a little and the nuts will be toasted. Leave to cool in the tin before removing from the tin and placing in the fridge to set properly. The cheesecake will keep for 3-4 days in the fridge. Best served at room temperature on it’s own or with some crème fraiche if you like. This weekend as is traditional in the ‘Smith’ family we all headed to my parents for my Mum’s birthday. It’s nice knowing that whatever happens, however busy we all are, we all make an extra special effort to ensure we keep the weekends free for celebrating birthdays in our family. It means that excluding Christmas, there is at least six occasions in the year when everyone gets to catch up, have a drink and keep up-to-date with what we’re all up to. And it’s been like that for as long as I can remember. I think that makes us pretty lucky as a family and I’m looking forward to when my sister moves back to the UK and can join us at the kitchen / garden table in person rather than on skype sat at the table on a computer screen! 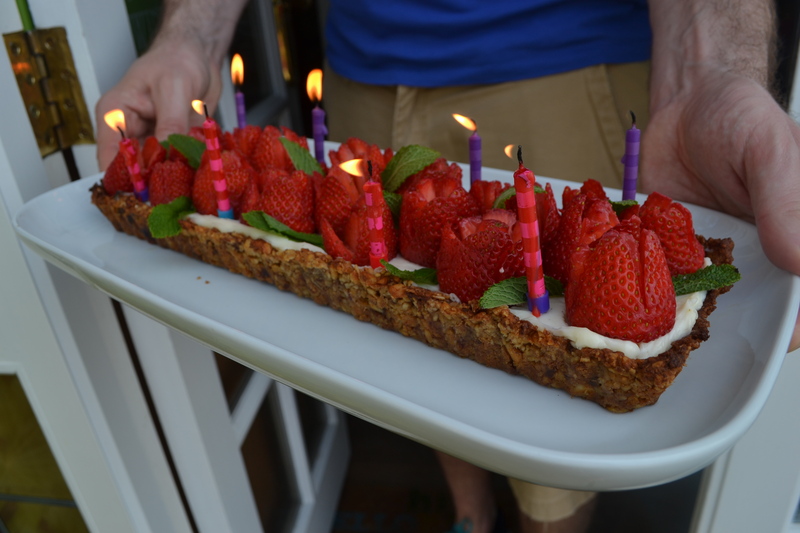 Mum normally conjures up the desserts for these birthday celebrations but seeing as it’s her birthday, my Dad and I did our best to only let her make some ice cream so that I could provide the birthday cake / tart. 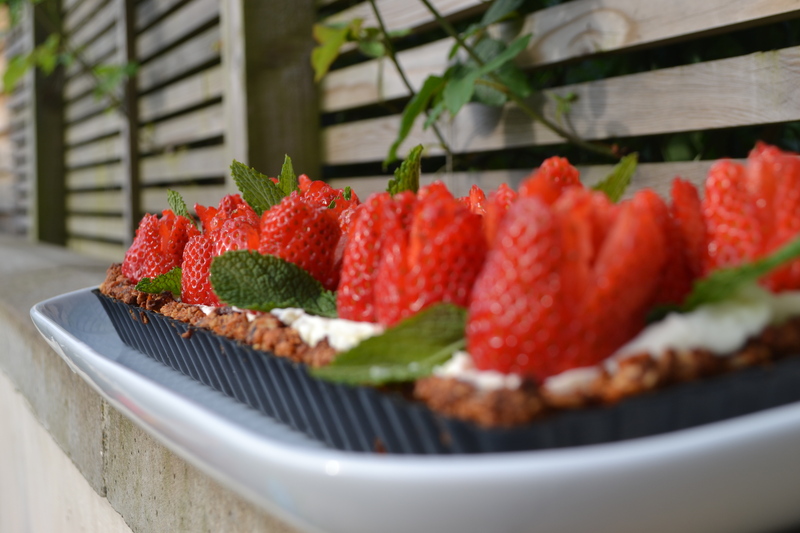 I saw this dessert on a blog that I love to read called ‘how sweet it is’ and it immediately came to mind as the perfect dessert to make for Mum on her birthday. 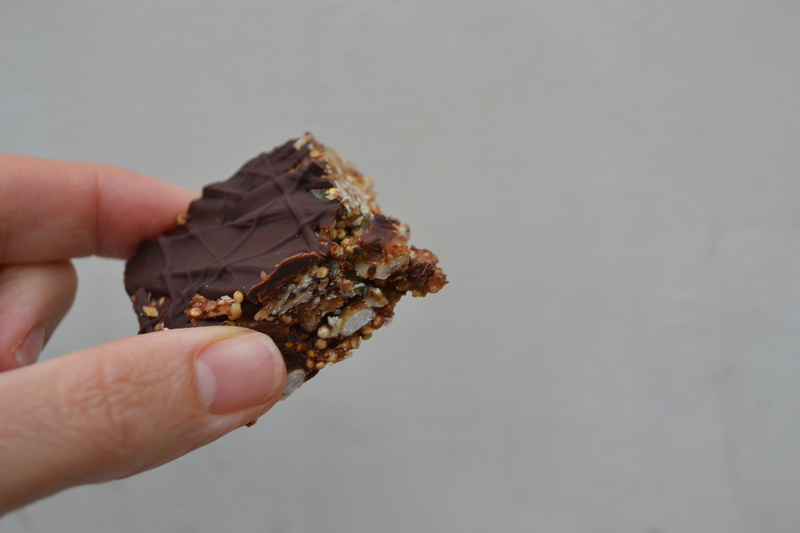 The author of the blog, Jessica, has the most infectious love of all things food that just reels you in and makes your mouth water at all the beautiful photos she takes of her creations. You just wish you lived in her household so that you could get to taste it all… although I’d be about five stone heavier if that was the case… she doesn’t hold back on the extras which makes you like her even more. 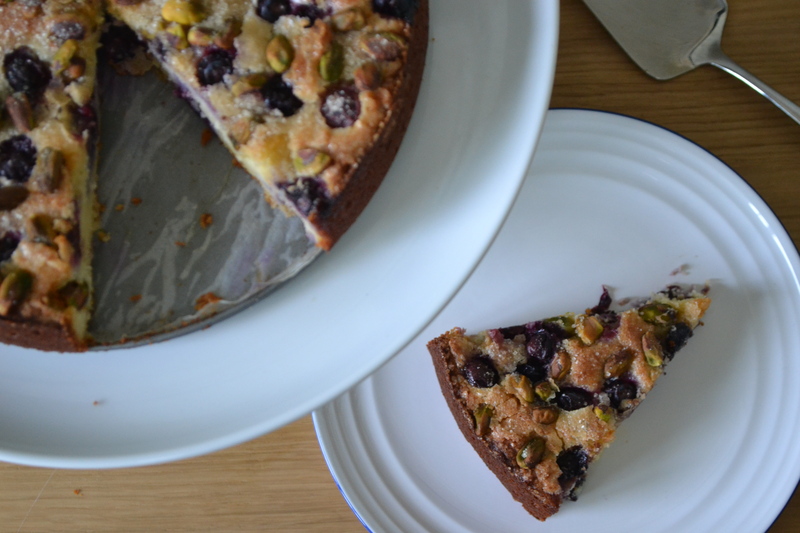 The great thing about this tart is that it is so beautifully simple to make but looks like you must have been slaving away in the kitchen for hours to make something so delicious and pretty. With fresh juicy strawberries in season and the fact that they are cut into delicate roses, it really does shout the perfect summer pudding for any celebration. The only twist I made on this pudding was to create a crust using nuts, oats and dates rather than a more traditional cheesecake base of butter and digestive biscuits. I thought the crunch of nuts and oats would work well against the smooth creamy mascarpone smothered on top and I wasn’t wrong. 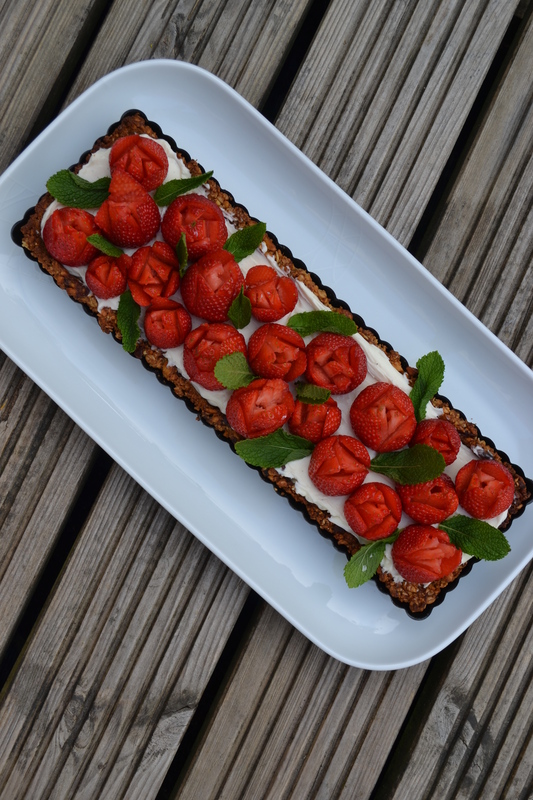 It was like having a lovely flapjack base (without all the sugar) and the rose strawberries stood bright and inviting against the pillows of mascarpone cream. It got Mum’s approval and that’s the main thing. 14-16 strawberries (depending on the size of the strawberries) cut into roses if you have the time! Pre-heat your oven to 170 degrees. Butter ‘well’ your 4 x 14 inch loose bottomed tin. Place all your ingredients into a food processor and pulse until you’ve got a crumbly texture, you don’t want flour, but you need the dough to be sticking together. Press the mixture into your tin and up the sides to create your crust. Try to make it as smooth and even as you can with the back of a spoon. 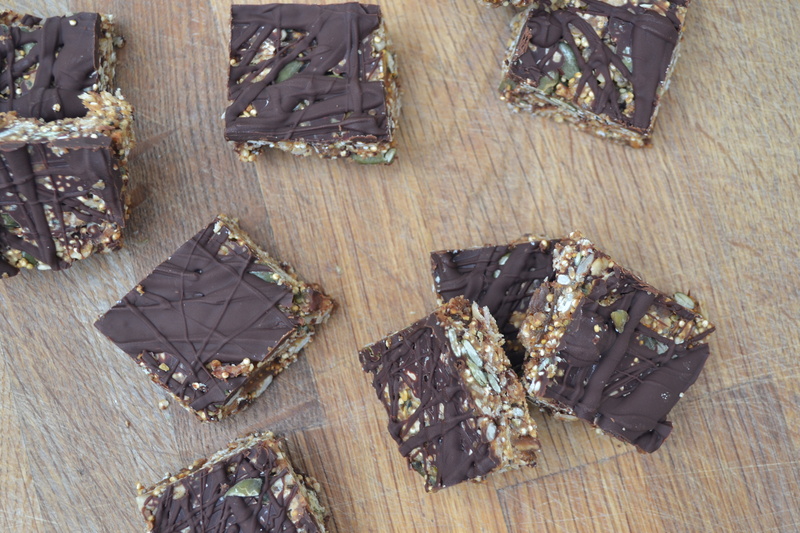 You might have a bit too much mixture, so don’t over fill once you’ve got a thin even layer of crust in your tin. Bake in the oven for 20-25 minutes. You’re looking for a light golden colour. Leave to cool in the tin. You can make the crust up to a couple of days in advance and store in an airtight container or covered in cling film. Leave it in the tin for now in case you knock it. It will be quite crumbly. Stir together the mascarpone, icing sugar , lemon juice and vanilla bean paste until it is well combined, creamy and spreadable on your base. Spread the mascarpone filling into your base so that you have an even layer and place in the fridge to chill. 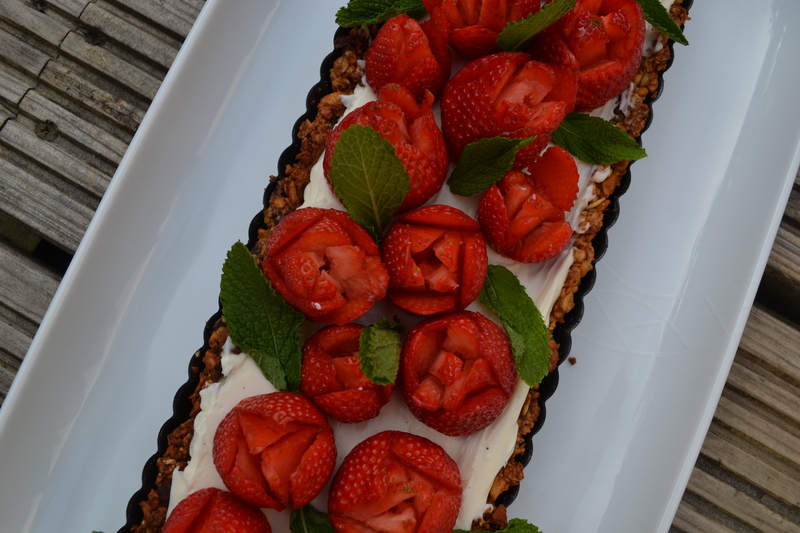 When you’re ready to serve, add your strawberries, mint leaves and drizzle on some honey if you fancy. Remove from the tin before serving, it should just slide out if you buttered the tin well! This weekend Will and I celebrated our 5 year wedding anniversary. Wow time flies! So much so that I was convinced it was 4 years and had actually written the card saying it was 4 years and had planned a dessert on the fact that it was 4 years because the traditional gift for 4 years is flowers or fruit and now it turns out I should have come up with a ‘wood’ based present. (And breathe!) Total wife fail on my part (holding head in shame!). I have a feeling he’ll forgive me though, when he spots the rhubarb Eton Mess in the fridge and the pizza dough proving – which was his meal request this weekend. We’re actually getting to go on a rare evening out to our local (but ridiculously good – The Brown Dog in Barnes – it’s so worth a visit) restaurant on our actual anniversary, but I still thought a yummy home cooked dinner was required to finish off the celebrations properly the following evening. I have so many amazing memories of our wedding day but nothing stands out more than walking up the aisle and seeing Will turn round with a big smile on his face and knowing this was the start of the rest of our lives. When people say; try and just take the day in because it goes so fast, they couldn’t be more right. The day flew by with a flurry of surprises we’d organized for the guests from chefs carving at the tables, a cheesecake wedding cake, a sweets table, a photo booth, Pimm’s Bar in the barns and a headphone disco to top off the evening! It was pretty epic and I’d love to do it all again tomorrow. Maybe for our 10 year wedding anniversary we can renew our vows…my parents do love to host a party (you know it would be fun Mum and Dad). Now back to the dessert I had already planned for our 4 / 5 year wedding anniversary. Will is quite a fan of an Eton Mess, so much so he regularly suggests it when we have a dinner party, but I’m always keen to try something new. But because I’m so nice and I know how much he has a soft spot for this dessert, I thought I could make a twist on the traditional Eton Mess made with strawberries and raspberries. Rhubarb is in abundance in the shops at the moment so I wanted to use this beautifully pink tart fruit in place of the berries and pair it with some rhubarb ripple ice cream with praline pecans. I thought I could bring the two together by adding a few chopped praline pecans to the Eton Mess as well. Let’s be honest, you can’t go wrong with rhubarb, cream, meringue and pecans and this didn’t disappoint. 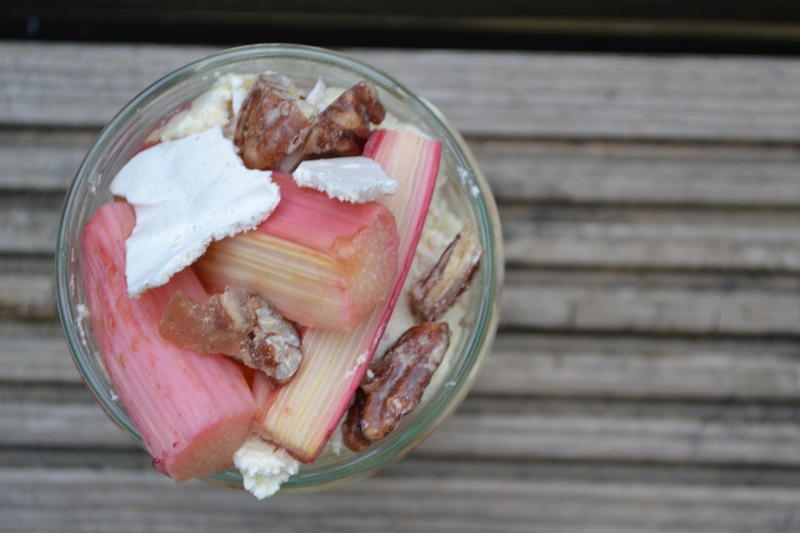 It has the components of an Eton Mess but with some additional crunch from the pecans and tartness from the rhubarb. You don’t have to add the ice cream (in fact we were so full after dinner, we decided to forgo the ice cream) to the side if it seems like too much of an additional faff, the rhubarb with the cream and meringue is still a winning combination especially with rhubarb being in season right now. 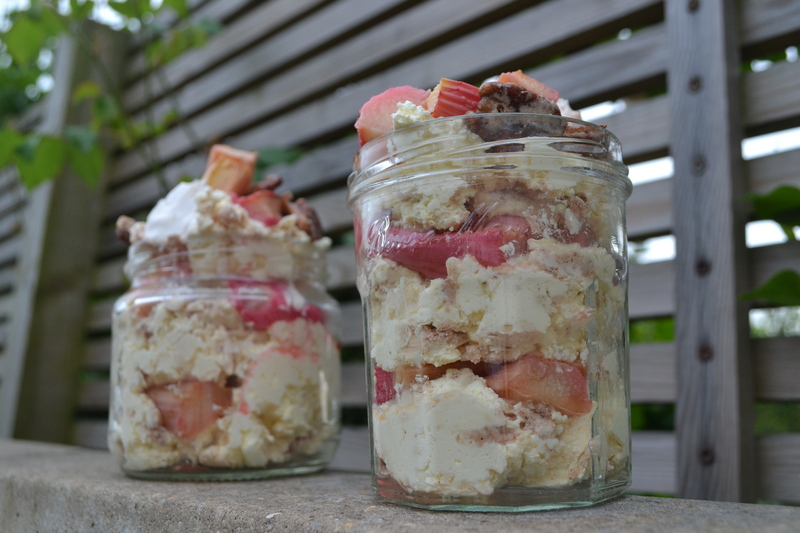 Even if you’re not celebrating an anniversary this weekend, I still think you should celebrate with this indulgent rhubarb Eton Mess for pudding and put a smile on your loved ones face. 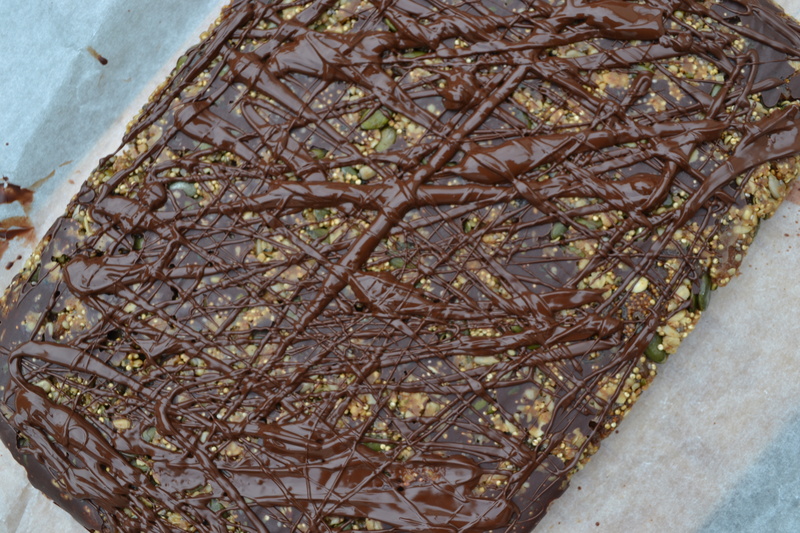 Place your chunks of rhubarb onto a lined baking tray and sprinkle with coconut sugar. Place your baking tray in the oven for 15-20 minutes. You don’t want them to turn to mush so keep an eye on them. Leave to cool before transferring to a bowl ready for assembly later. Place the egg whites in a large bowl and using an electric hand whisk or Kitchen Aid mixer, whisk on a low speed. Continue for about 2 minutes, until the whites are foamy, then switch the speed to medium and carry on whisking for 1 more minute. Now turn the speed to high and continue whisking until the egg whites reach stiff-peak stage. Next, whisk the sugar in on a fast speed, a little at a time (about a dessertspoon), until you have a stiff glossy mixture. It is important that you don’t just add all the sugar in one go. Just at the end add your cinnamon and ginger and mix through. Spoon heaped dessertspoons of the mixture on to a baking sheet lined with baking parchment. Space the two meringue nests with enough room between them as they will spread a little on baking. Don’t worry too much about making them look pretty as you’ll be breaking them up later anyway. Pop them on the center shelf of the oven, immediately reduce the heat to 140°C and bake for 30 minutes. After 30 minutes, turn the oven off and leave the meringues in the oven to dry out in the warmth of the oven until it is completely cold (this will take about 4 hours). When cold, take the meringues out the oven and place in an airtight container ready for later when you create your dessert. You can freeze the meringues at this point if you are making them well ahead or having made a bigger batch. Beat the cream until slightly thickened, then add in your icing sugar and vanilla extract and continue to beat until the cream is thick. Keep an eye on it as it’s easy to over whip before you know it. Crush up your meringues into decent size chunks and then fold the chunks through your cream. 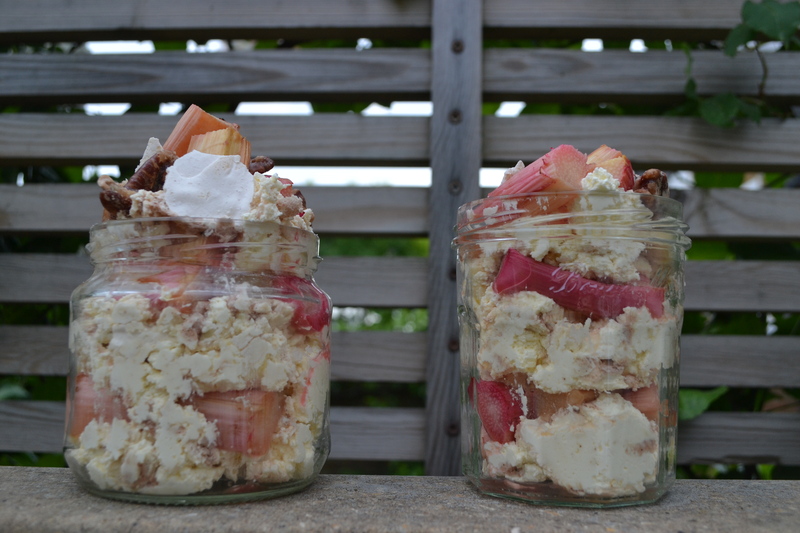 Begin with dollops of the meringue & cream mixture at the bottom of your jar/ glass followed by chunks of rhubarb and continue until you have a full jar. Sprinkle on your praline pecans for decoration. 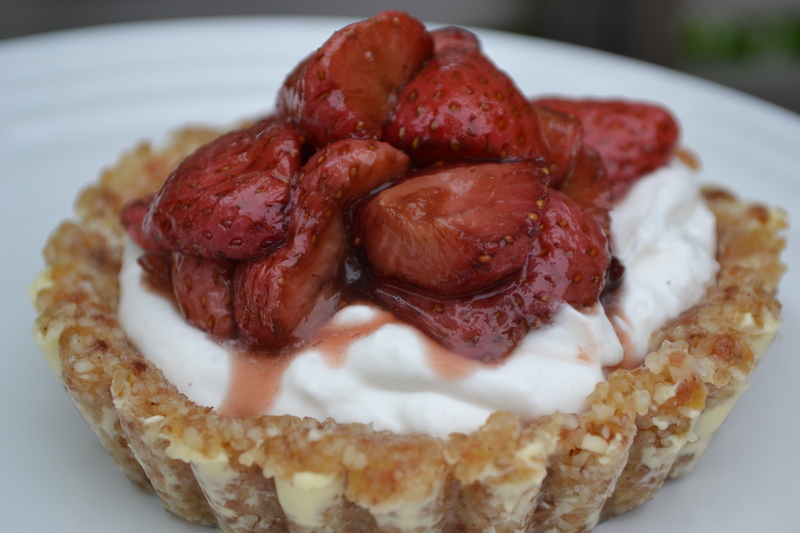 Serve with a side of rhubarb ripple ice cream for extra indulgence! Pour 250ml of the double cream into a large saucepan. Add your sugar, salt and vanilla seeds along with your pod to the saucepan. Gently warm the mixture, stirring all the time until your sugar is dissolved and you can take it off the heat. Once removed from the heat, add your remaining cream, milk and vanilla extract and stir through. Pour the mixture into a jug (this will make it easier to pour into the ice cream bowl later) and chill in the fridge for at least a few hours or over night. 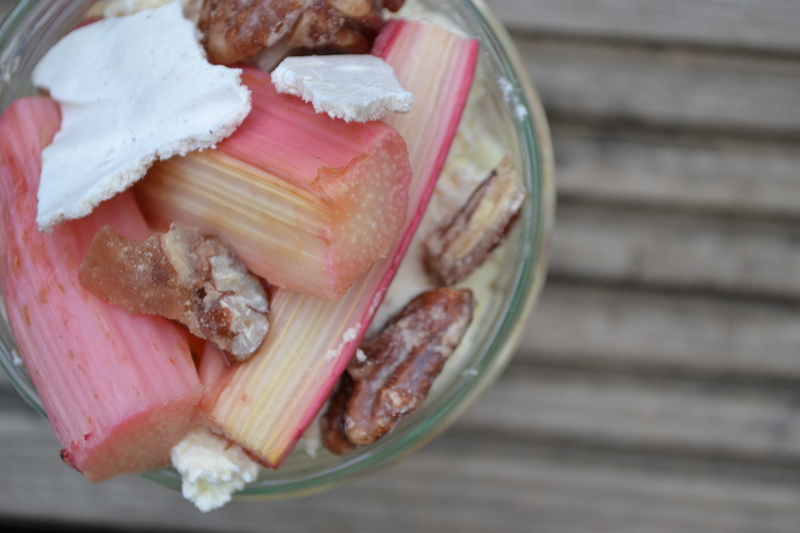 You can now get on with making your rhubarb ripple and praline pecans. When ready to churn, remove the vanilla pod and then freeze the mixture in your ice cream machine according to its instructions. Place the rhubarb, ginger, cinnamon and water in a saucepan and heat on a medium heat for approximately 20 minutes. 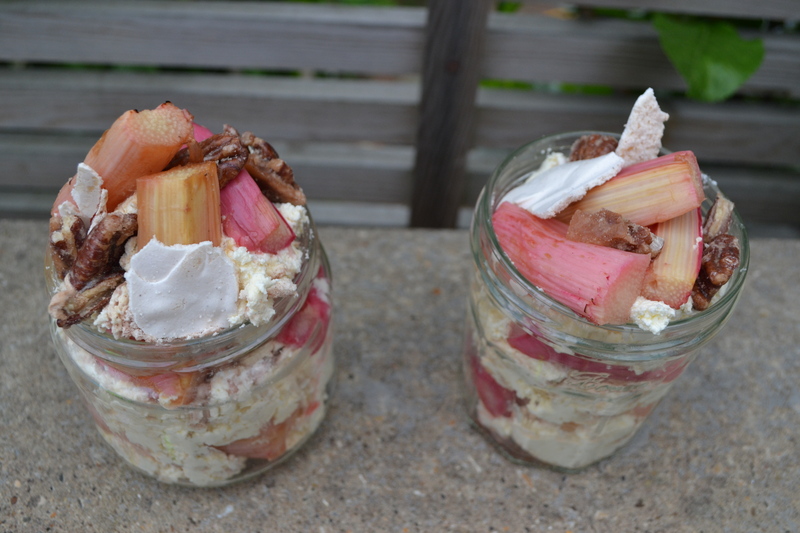 You are looking to achieve soft rhubarb but you don’t want it to burn or to turn it to jam! 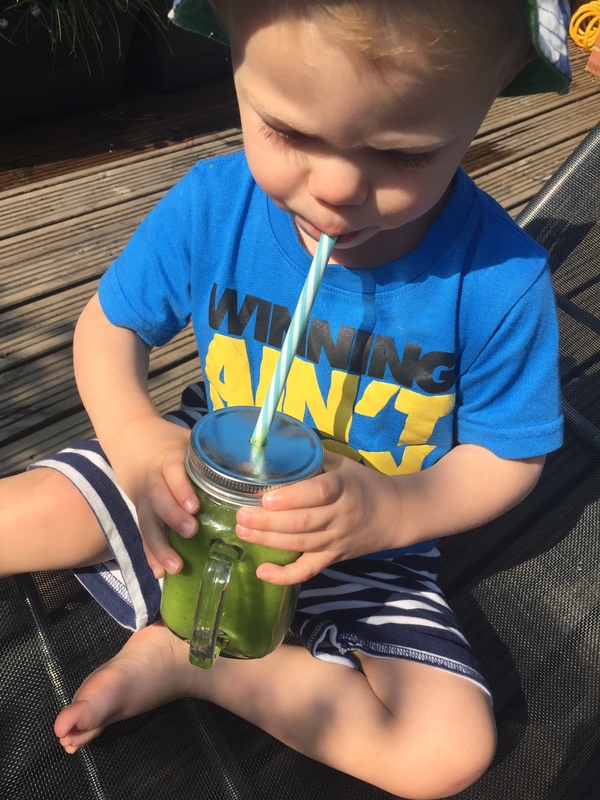 A little juice is good as it will help with that ripple effect you are looking for. Once you have the desired consistency, remove to a bowl and leave to cool. This can be kept in an airtight container for a few days. Mix the water, sugar and pecans in a large saucepan / frying pan on a medium to high heat. Continue to stir with a wooden spoon until the sugar has dissolved and the liquid has boiled. Reduce the heat and continue to stir until the liquid has crystallised and become sandy. You will then notice the crystals begin to liquefy and this is what you need to coat your pecans in to give them a glazed glossy coating. Once your pecans are lovely and shiny pour onto a lined baking tray – trying to space them out a little and sprinkle with the sea salt. Leave the pecans to cool before touching as they are VERY hot! Once cooled, using a strong large knife, cut into chunks of a variety of sizes. You are going to use ¾ of your pecans in your ice cream and keep the rest back for decoration on your Eton Mess. Once your ice cream is nearly churned, you can either add your rhubarb ripple and pecans to the churning process or I find it easier to finish off the churning process completely and add the extras after. Spoon out enough ice cream to cover the bottom of your airtight container before adding dollops of rhubarb and sprinkles of pecans. Top with more ice cream before adding your rhubarb and pecans again. Repeat this process until you have used up all your ice cream, rhubarb and pecans. Work quickly though so that your ice cream doesn’t melt too much. Place your airtight container in the freezer to freeze properly. Serve along side your Eton Mess.